I got some mail from the IRS a few days back (though for some reason the letters are dated a few days in the future ). 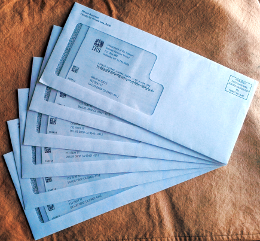 As their customary way of reminding me how wisely the government spends tax dollars, they informed me of these amounts in six different letters sent in six different envelopes and accompanied by six return envelopes. I haven’t sent in my 2014 return yet, but I expect it’ll put them after me for another $6,000 or so. In 2008 I didn’t make enough to owe anything, so that year is missing.